Find the right colour for you! Paint can be the quickest and most cost-effective way to transform a room. But where do you start if you haven’t already picked out a colour? We interviewed three interior designers for their best tips. These practical suggestions will have you feeling more colour-confident in no time. Shopping your wardrobe can help you come up with ideas not only for your wall colour, but also for accents. If you tend to wear a lot of blue and often pair it with khaki, dark leather shoes and silver jewelry, perhaps those colours could be a theme for your home. You could translate that theme to your living room by trying navy walls, adding rich leather accents, plus silver candlesticks, tchotchkes and photo frames. Inspiration can come from anywhere. “Maybe your grandmother’s kitchen was yellow, and you have great memories of traveling with her. Maybe you saw this great shade of blue when you were traveling in the Caribbean, and it calms you,” she says. If no colours come to mind from your memories, try getting out a photo book from one of your favorite trips and seeing if any colours speak to you. As you go about your days, visiting restaurants, shops and even other people’s homes, pay attention to which colours you’re most drawn to. So you’ve decided to paint your room blue. How do you narrow down which blue? It can be helpful to think about the feeling that you want to create in the room, Wardlaw says. If you’re seeking a cozier feel, choose a blue on the darker end. If you’re going for a more serene vibe, a lighter, perhaps sea blue may be better. As you’re drawn to shades of blue, pay attention to whether you prefer blues that tend toward lavender, green or pure hues. Knowing the undertones of the shade you’re selecting is useful when looking for trim and accessories. To make sure you get what you want, Carl Mattison of Atlanta-based Carl Mattison Design suggests enlisting the help of a friend to test your colour perception. “Take a couple colours and ask your friend, ‘What do you see in this colour?’” Mattison says. This can tell you whether the way you’re seeing a colour is the way someone else will see it. “Have someone else tell you if it’s a cold gray, or is it a warm gray,” he says. And if you’re not sure you’re seeing what they’re seeing, ask them why they describe the colour in that way. This exercise can help you avoid blind spots that could derail your colour intentions. Keep in mind that if you’re starting from a blank slate, a cool gray or a warm gray might suit you equally. But if you already have furniture and accessories in warmer hues, you may want to choose a warmer tone that complements what you already have. The way colours read on your computer screen or mobile device probably won’t read the same way in your room, where they’ll be affected by the amount of light and even the landscaping that the light is coming through. Use digital photos for general colour and style ideas, and “tone and value inspiration — meaning light or dark or medium,” Mattison says. It’s also important to look for rooms that are of a similar size and shape to the one that you’ll be painting; that way, the effect will be more similar. This is critical: If you fall in love with a colour online, go out and select a swatch and bring it home before committing. “Your iPad, your phone, your computer is going to display those colours differently,” Mattison says. Even colour chips won’t be exactly how the paint colour will appear. “They are the closest representation to it,” he says. Finally, it’s time to visit the paint store. Pick several shades and don’t worry about choosing among them while you’re in the store, likely under fluorescent lights. Instead, bring them home. Then it’s time to narrow them down. “Say you come home with eight shades of blue,” Porter says. “Lay all the swatches out and compare them to each other. You will start to see the subtle differences between each colour. Some of the blues lean toward green or aqua. Some are a denim shade. Some have a funky undertone that you just don’t like at all.” Porter and Mattison recommend weeding out the shades you don’t like until you have no more than three options left. Wardlaw says four shades are OK.
You can tack the colour chips to the wall of the room you’ll be painting, or use a sheet of paper as a neutral background. Keep in mind as you make your comparisons (whether on the wall or paper) that the paint chips will appear a bit darker on a light background, and lighter on a dark background, Porter says. “Often, after comparing the paint chips to each other, it will be pretty clear which colour is going to work,” she says. If you still aren’t comfortable with the colour options, you could consider taking away all but one option and looking at each colour individually. 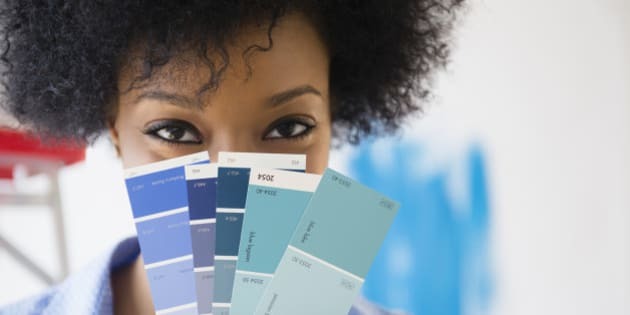 Also, this may sound obvious, but it’s easy to forget: As you assess colours, consider how each option will look with the elements of your room already in place (and that you’re not willing to change). Once you’ve chosen your three or four final colours, it’s time to test them. All three of our experts agree: It’s better to paint the wall than those sample boards the paint store sells. This is not just because it’s more economical. “You need to paint at least a 1-by-1-foot square on all four walls,” Wardlaw says. “You paint on the wall because that’s exactly where it’s going. You’re painting over a previous colour. I feel a board doesn’t saturate in the same way.” Mattison recommends painting an even larger area — at least 3 feet by 3 feet — for each sample colour. Porter advises placing the paint samples side by side on the wall. “They should still be lined up because one would still need to compare and choose based on the process of elimination,” she says. Again, if this is overwhelming for your eye, you could consider looking at them apart. It’s also important to make sure the sample you purchase has the finish that you’re planning to use (matte, eggshell, satin, high gloss) because that can also change the way a colour reads. Many stores sell the sample-size cans only in the matte finish. You may want to consider buying a full quart to get the true effect. Look at the samples on the wall at various times of day, and try different types of lighting (various wattages) to see how that may change the colours. Live with the colours for a few days. When a clear winner emerges, you’re ready to paint the walls.